Ramblings' Journal: Did the Martians flush after they were done? Did the Martians flush after they were done? 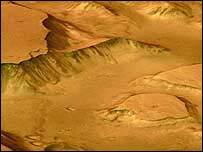 Evidence of life on Mars? Yep -- at least it looks like it. The BBC is reporting that ammonia may have been found in trace amounts on the Martian surface; some scientists are postulating that this could be a sign of urine from some sort of alien life form, be it microbial or otherwise. Researchers say its spectral signature has been tentatively detected by sensors on board the European Space Agency's orbiting Mars Express craft. Ammonia survives for only a short time in the Martian atmosphere so it must be getting constantly replenished. There are two possible sources: either active volcanoes, none of which have been found yet on Mars, or microbes. I hope they wash their alien hands when they're done.